Understanding 7 OSI Layer - In antiquity before the creation of the OSI, doing a communication on the computer network is not easy because each vendor and developer in that time using their respective network protocols, making it difficult for users when going to exchange data from a computer with another computer due to protocol networks owned by each computer is different. Seeing this, in the 1980s the international standardization body of the International Organization for Standardization (ISO) created a reference model called OSI consisting of seven layers. Each layer has its own role so at this moment we do not have to worry about what computer protocol problem you will use to be able to communicate with your friends. For more details about the OSI layer or the OSI model, the seven layers and how it works, see the following description. Open System Interconnection or OSI is commonly referred to as a reference model in the form of a conceptual framework that defines a connection standard for a computer. The purpose of making this OSI reference model is to be a reference for vendors and developers so that the products or software they create can be interpor, which means it can work together with other systems or products without having to make special efforts from the user. In the process the OSI model is divided into seven layers in which each layer has an interrelated role between the layer above with the layer below. Here is an explanation of the seven OSI layers. 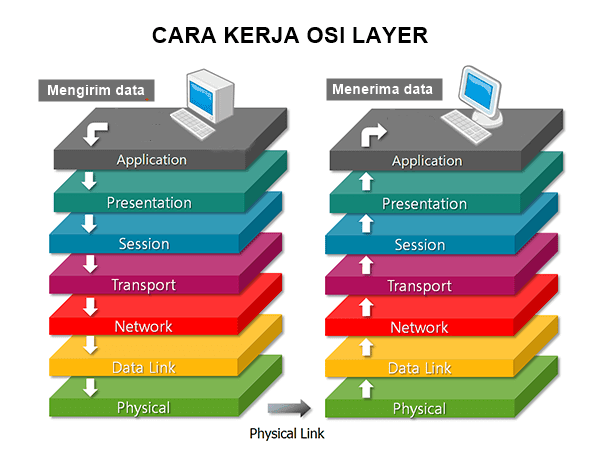 Physical layer is the first or lowest layer of the OSI model. This layer is responsible for transmitting digital data bits from the physical layer of the sending device (source) to the physical layer of the receiving device (destination) through the network communication medium. In physical layer data is transmitted using a type of signal that is supported by physical media, such as voltage, cable, radio frequency or infrared or light. The data link layer is responsible for checking for errors that may occur during the data transmission process and also wrapping the bits into the data frame form. Data link layers also manage physical addressing schemes such as MAC addresses on a network. The data link layer is one of the fairly complex OSI layers, so it is subdivided into two sublayers, namely the Media Access Control (MAC) layer and the Logical Link Control (LLC) Layer. The Media Access Control layer (MAC) is responsible for controlling how a device on a network gets access to the medium and permits to transmit data. The Logical Link Control (LLC) layer is responsible for identifying and wrapping network layer protocols and controls error checking and also synchronizes on the frame. The network layer is responsible for defining the path to be used to transfer data between devices within a network. The network router operates on this screen, which is also the main function of the network layer in terms of routing. Routing allows packets to be moved between computers connected to each other. To support this routing process, the network layer stores logical addresses such as IP addresses for each device on the network. Layer Network also manages the mapping between logical addresses and physical addresses. In the IP network, this mapping is done through the Address Resolution Protocol (ARP). The transport layer is responsible for sending messages between two or more hosts within the network. The transport layer also handles the splitting and merging of messages and also controls the reliability of the given connection path. The TCP protocol is the most commonly used instance of transport layer. Session layers are responsible for controlling connection session dialogs such as setting, managing and disconnecting between computers. In order to establish a communication session, the session layer uses a virtual circuit created by the transport layer. The presentation layer is responsible for defining the syntax that the network host uses to communicate. The presentation layer also performs the encryption / decryption process of information or data so that it can be used in the application layer. The Application layer is the topmost layer of the OSI model and is responsible for providing an interface between the network protocol and the existing applications on the computer. The application layer provides services required by the application, such as providing an interface for Simple Mail Transfer Protocol (SMTP), telnet and File Transfer Protocol (FTP). This is where the application is interconnected with the network. The process of running data from one host to another on a network is fairly long, all the data must go through each layer of the OSI to get to the destination host. Example for example when you will send an email to another computer on a computer network. The process that occurs first is on the application layer, which provides an email application program that will be used to send data to other computers through the network. The presentation layer of the email is then converted to a network format. Then on the session layer will be formed a session of travel data from start to be formed until the completion of the delivery process. In the transport layer the data is broken down into small parts and then will be collected back at the receiver transport layer. In the network layer will be created an address and determined the path that will be passed by the data to get to the destination. In the data link layer data is formed into a frame and physical address of the sending and receiving devices will be set. Then at the last layer the physical layer sends the data through a network medium, leading to the transport layer of the receiver. Then the same path occurs in the destination computer but starts from the bottom layer (physical layer) to the top of the screen (application layer). That's the full explanation of the OSI model and how it works. Understanding how the OSI screen works can improve your understanding of how a computer network works and the protocols that work there.